As a business if you use properly targeted keywords, your content can move to the top of the results page on a search engine. A massive 60% of all organic clicks go to the top 3 search results (in Google). This makes it essential to be ranked high so, yes, keyword research is really important. Why is keyword research useful? 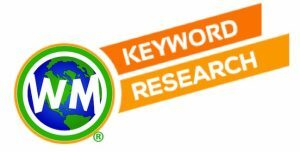 Keyword research creates the foundation for your content marketing and SEO (search engine optimization) for your website. Many companies make the mistake of thinking they know how the typical client searches for them online. What if I don’t do keyword research? It won’t be easy for those prospective clients to find you online when using search engines like Google. It will be like searching for a needle in a haystack. By guessing your keywords for the organic SEO on your website and your content you may drive the wrong traffic to your website.This will in turn increase your bounce rate which is when people visit your site but leave quickly as they find nothing of interest. Major search engines measure this as a negative for your ranking. The reason businesses create content for their sites is to draw potential clients to their website. If you use the wrong keywords and phrases or terms that are too generic then you will be too far down in the searches to be found. Get your content and website found by doing effective keyword research. World Markets Korea can conduct keyword research for both Naver (in Korean) and Google in various languages.